WATCH: Wreckage Of Costa Concordia Begins Its Final Voyage : The Two-Way More than two years after the luxury liner wrecked off the Italian island of Giglio, it is finally being moved to a salvage yard in the port of Genoa. 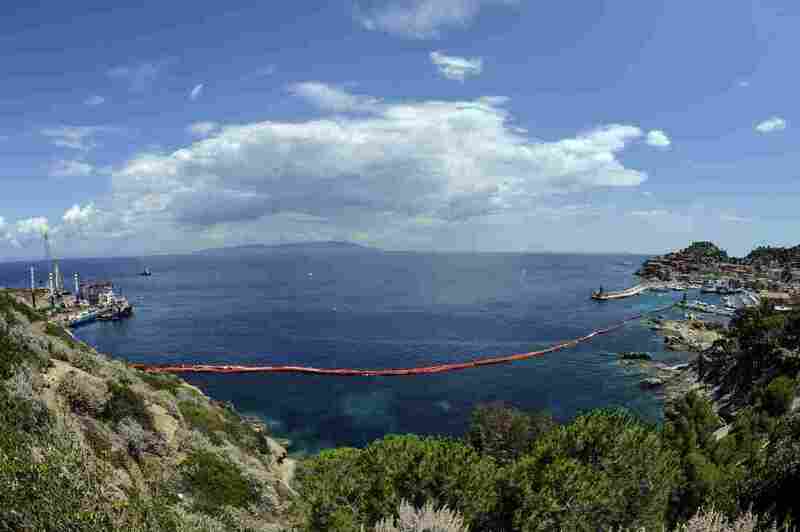 The harbor of the Italian island of Giglio, after the wreck of the Costa Concordia was towed away. Italy's once-luxurious cruise liner embarked on its last voyage on Wednesday. More than two years after the luxury liner Costa Concordia wrecked off the Italian island of Giglio, killing 32 people, its wreckage has finally begun its voyage to a salvage yard in the port of Genoa. "Boat sirens and fog horns sounded through the tiny Italian port of the island of Giglio when the moorings of the Costa Concordia were finally loosened. "The 15,000-ton vessel — the size of three football fields — had been flipped upright last September in a complex operation called parbuckling. "Then, 10 days ago, salvage workers and engineers began to refloat and stabilize the ship. "This morning, encased in a straightjacket of 30 fotation tanks, and escorted by a 14-vessel convoy, the ship began its journey. At a steady speed of 2 knots an hour, she's expected to arrive in Genoa on Sunday. "The convoy includes a marine-mammal spotting boat as it sails through the Tuscan archipelago, Europe's largest marine sanctuary." Back in September, we posted a time-lapse video of the Costa Concordia being righted.